Why indeed? When I stand in the middle of my new garden that’s exactly what I wonder. I moved here 2 months ago and the house itself has taken up so much time – and it’s still not finished, but it’s the outside that’s going to be the subject of this blog. My progress from derelict garden to Garden of Eden may be ambitious but who knows….. with a bit of luck and quite a bit of time and effort we might make a stab at it. 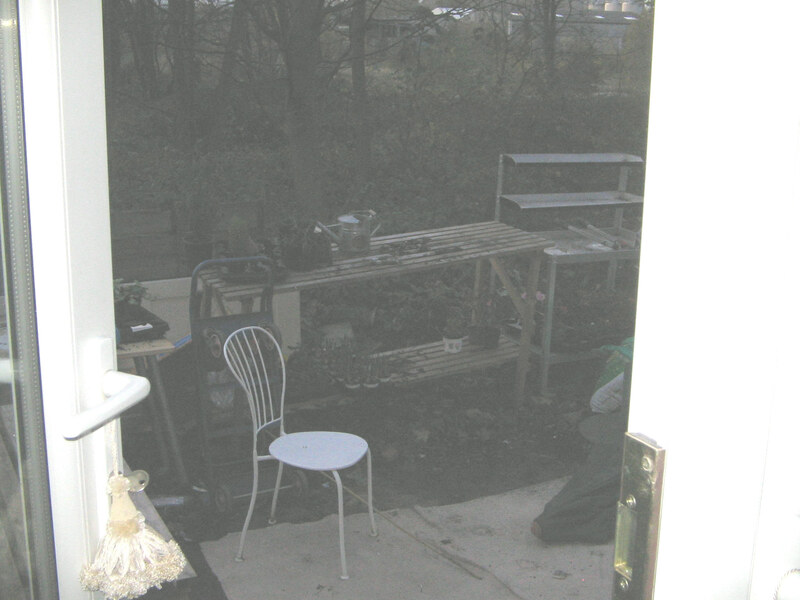 You can barely see anything in the miserable light but this was the view from the French windows the other day, some of my greenhouse staging and the potting table waiting to be housed in the greenhouse which is still in bits against the house wall. I’ve started clearing but you wouldn’t know it! We had one huge bonfire on Bonfire Night (what else), and I’ve built another one but it’s too cold and wet to set fire to it, and I’ve stacked up two heaps of wood at the bottom of the garden where I hope the wildlife will enjoy them. And I’ve started to pull out all the other junk my predecessor seemed to think it was a good idea to chuck/bury around the garden, both inside and outside of it. I have lots of plans as you would expect from a woman who spends her working life in other people’s gardens, either redesigning them or maintaining them, but will I have the time? Well follow the progress. More pictures in the morning providing I’m not snowed in.